Herr Padel was a native of Christiansfeld, Schleswig, and first came to England at the age of seven years; he received his early training from an uncle, a professor of music in Harrogate. At the age of sixteen he became a student of the Leipsic Conservatoire under Plaidy, Mocheles, Reinecke and Hauptmann. Herr Padel received a special prize for piano-playing, and there, for the first time, he played Schumann’s Concerto in public. 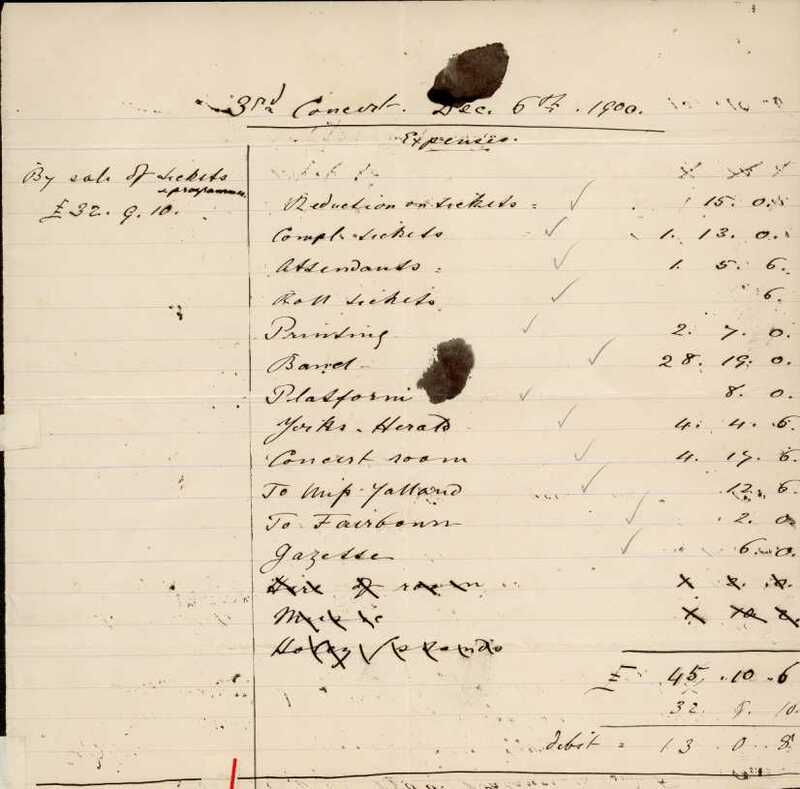 In 1865 he settled in London. His uncle at Harrogate, having extended his work as a teacher in York, retired and was succeeded by Herr Drouet, a brilliant pianist and pupil of Mendelssohn. Drouet retired in 1868, and according to a previously made arrangement, the practice in York was transferred to Herr Padel, whose success as a teacher and whose devotion to the cause of classical music have become so well known as to require no further comment. 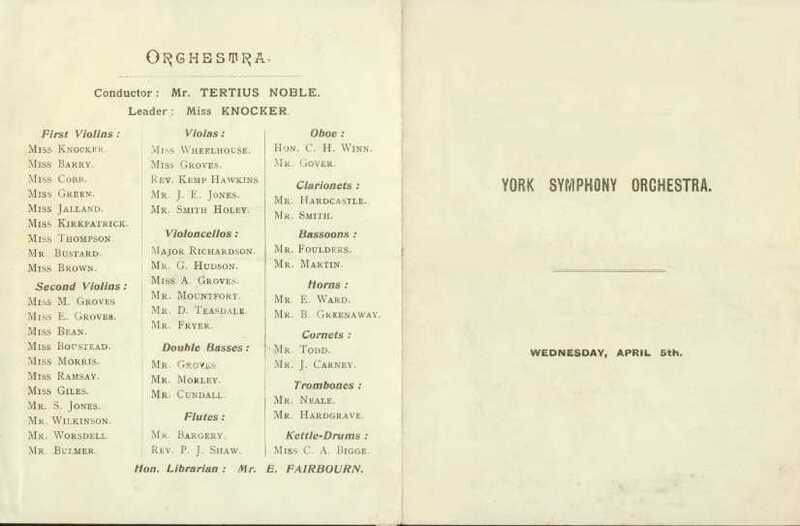 The York Symphony Orchestra was founded in 1898 by the then Minster Organist T. Tertius Noble , assisted by local professional musicians, especially the eminent local violinist Editha Knocker , who had studied with the great Joachim in Berlin. The majority of players were, however, amateurs, drawn from the instrumental section of the long established York Musical Society . 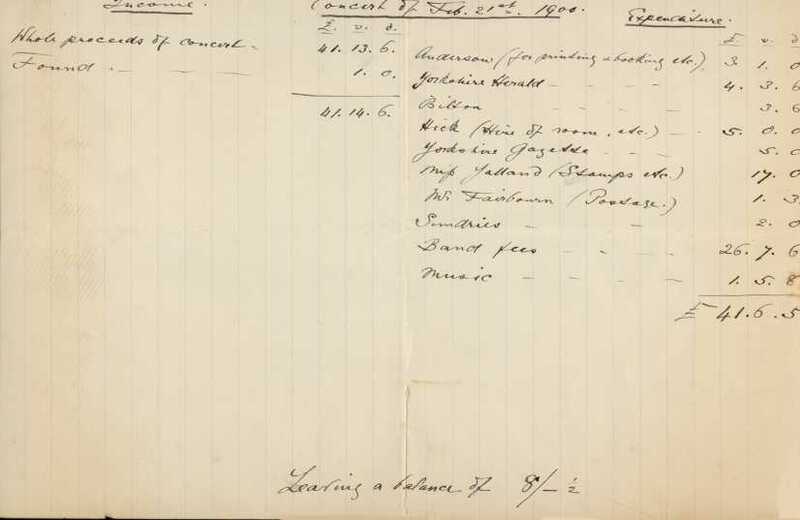 At first professional assistance was necessary, especially in the woodwind and brass sections, but this became unnecessary as the numbers grew – membership reached 77 by 1906. 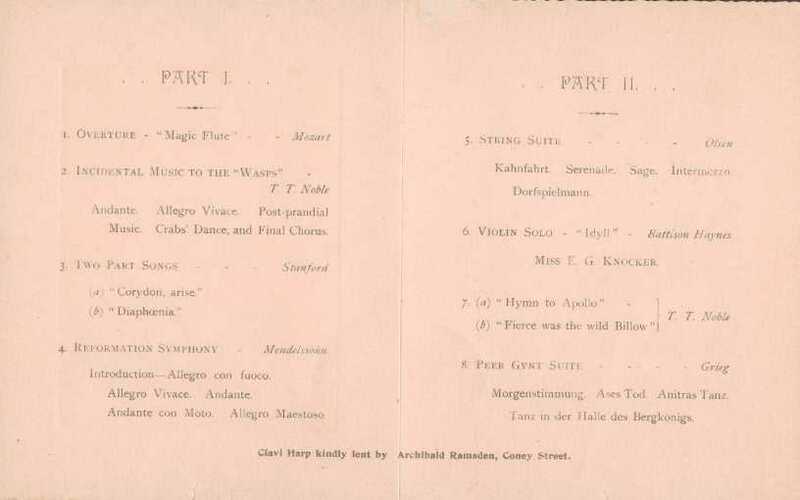 The first rehearsal was held in June 1898, and the first concert took place on 5th April 1899. 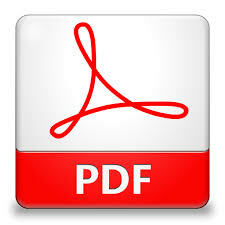 It included works by Elgar, German, and Tertius Noble himself. From then until the outbreak of the First World War the orchestra performed two concerts a year. The ‘best’ Amateur Orchestra in the Country? Though the standard of the performances at first no doubt left something to be desired, the critics soon remarked on the rapid progress made. The reputation of the orchestra spread, and it soon came to be regarded as one of the best amateur orchestras in the country. The composers Edward German and Samuel Coleridge-Taylor came to conduct the orchestra in performances of their own works in 1903 and 1905, respectively; the latter remarked that he did not consider it to be ‘one of the best’ amateur bands in the country, but rather ‘the best’. 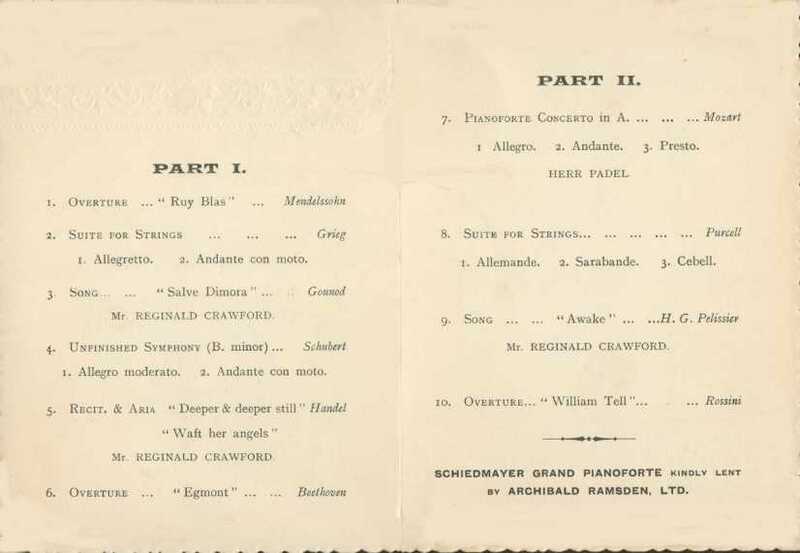 Soloists who played with the orchestra included not only local musicians such as Herr Padel , a German-born pianist, and Leila Willoughby , a violinist and pupil of Miss Knocker’s, but also nationally and internationally known musicians such as the pianists Fanny Davies, Alfred Hollins and Leonard Borwick ; the violinists Nora Clench and Michael Zacharewitsch ; and the singer Harry Plunket-Greene . After initial caution, the orchestra’s musical repertoire became quite wide, reflecting Tertius Noble’s broad musical tastes and also the orchestra’s growing competence. It included not only the standard classical works – Mozart, Beethoven, Schubert, and Mendelssohn were well represented – but also modern works by Elgar and other contemporary English composers. Commentators were in no doubt that the driving force behind the orchestra, and the secret of its success, was Tertius Noble himself, with his infectious enthusiasm and energy, and his clear beat. The orchestra was popularly known as ‘Mr. Noble’s Band’. It regarded itself not merely as providing entertainment for the citizens of York, but also as having an educational role, for the players as well as the public. 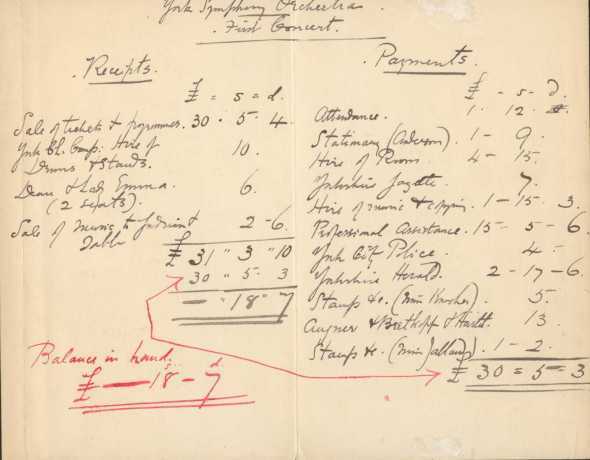 In spite of its musical success, the orchestra’s financial position was always precarious, and support from York’s citizens was not always forthcoming. The City Council allowed the orchestra use of the Great Hall of the Exhibition Buildings at a reduced rate, on condition that 1000 seats at the back of the hall were made available to the ‘working classes’ at 1d each, but one critic expressed the suspicion that some of those occupying these seats were not bona fide ‘sons of toil’, and could have afforded better seats. 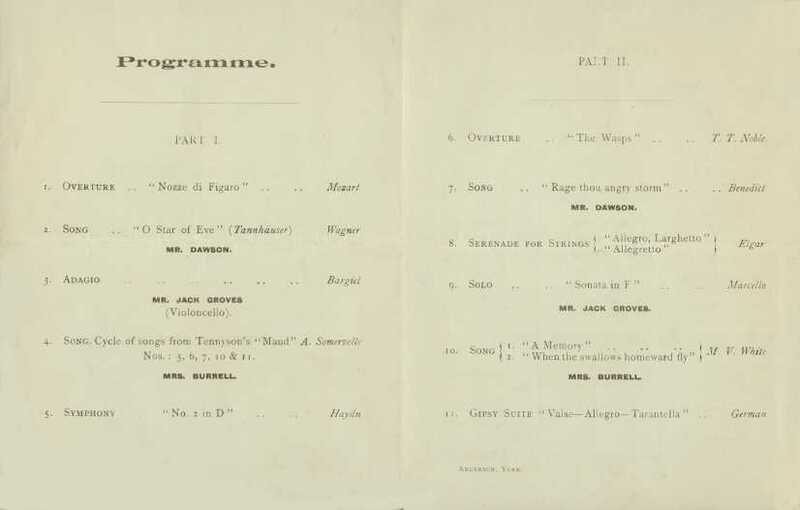 Be that as it may, after small profits on the first two concerts, the orchestra consistently made a loss, and had to be supported by donations, though a subscription scheme, started in 1907, made the financial situation a little more secure. In 1913, Tertius Noble accepted the position of Organist at St. Thomas’s Church in New York, one of the wealthiest churches in America. His departure left a gap which was difficult to fill, and the post of conductor was taken over – rather reluctantly – by Edward Bairstow , Mr. Noble’s successor as Minster Organist, though some works were conducted by Miss Knocker, her place as leader being assumed by Leila Willoughby on these occasions. However, this arrangement was not altogether satisfactory, and the difficulties were compounded by the orchestra’s rising debts. Nevertheless, the orchestra continued with an ambitious programme of concerts, with the well-known singers Caroline Hatchard and Campbell McInnes as soloists. But further difficulties appeared inevitable when, in July 1914, Miss Knocker announced her resignation, with the intention of returning to Berlin. The outbreak of the First World War thwarted Miss Knocker’s plan, but it also made further rehearsals and concerts by the orchestra impossible, as all the halls in the city were commandeered by the military authorities. Apart from a joint concert with the York Musical Society in the Minster, in December 1914 – a performance which caused considerable controversy by including Brahms’s German Requiem at a time when the country was at war with Germany – the orchestra was unable to perform again for the duration of the war. 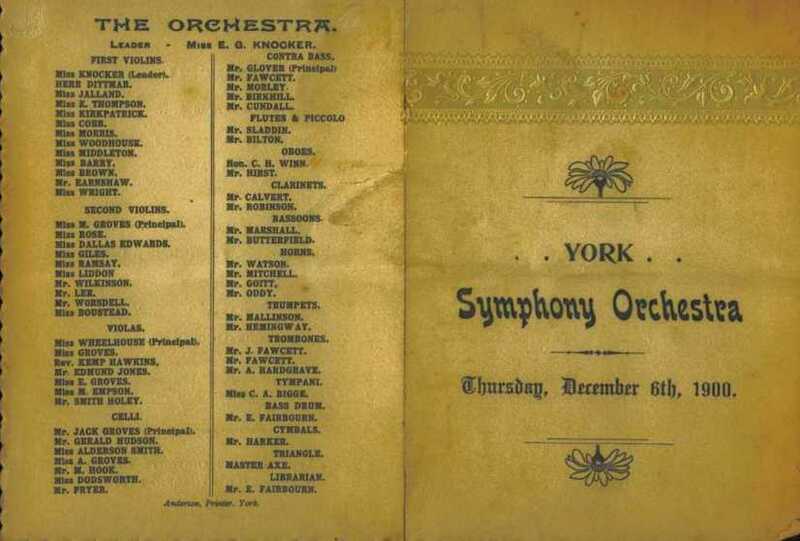 In 1915, proposals were drawn up to re-unite the orchestra with the Musical Society, which would take over its debts and assets, but this plan was never put into practice; the York Symphony Orchestra, though dormant, was not yet ready to die. 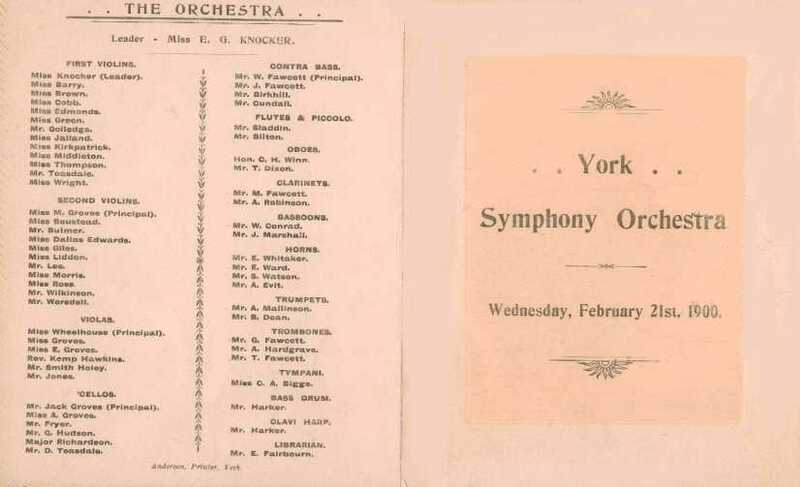 This page is an index to the biographies and photographs of people associated with the York Symphony Orchestra, and referred to elsewhere in this website, including conductors, leaders and soloists. Shaun Matthew – Tuba soloist June 2015; Conductor, September 2015 ff.